I was in Amish country in Ohio last weekend and found this in an antique shop. It seemed interesting and reasonably priced so I bought it. I did notice the surface rust. The cleaver is 9" from heel to toe on the blade and weighs almost 3 pounds. Can someone tell me how to remove the surface rust and how to keep it from rusting? 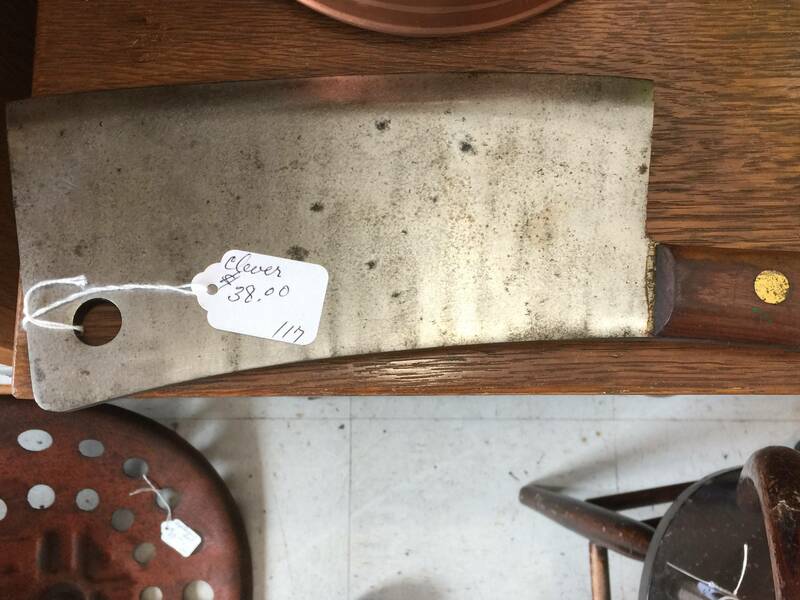 Does anyone know what kind of cleaver it is and what it is good for? For the rust you can try an oxalic acid cleaner like Barkeeper's Friend (try it on a small spot first!). It's worked great for my bakeware's cooked-on spots, and should be useful for rust as well. Using it will be a bit of trial-and-error, because leaving the metal exposed for too long will etch it, and not long enough won't clean much. For rust prevention, just clean the cleaver after each use and thoroughly dry it. I'm not sure what it's made of, but those steps should suffice to prevent rust formation. If you're obsessive about this, or don't cleave often, you can coat it in petroleum jelly afterwards (I do this with my straight razor. It's probably not feasible for a kitchen tool unless you're storing it away). For later maintenance, once the coarse rust is gone: Attack small rust spots with a cloth and a bit of toothpaste as soon as they appear. If you want to keep the cleaver oiled, use a food safe oil of the kind that is also sold to maintain cutting boards (eg food grade mineral oil. Not a cooking oil that could become rancid, not a non-food grade oil like gun oil or WD40, not any oil that easily polymerizes into a sticky resin). Do not obsess too much about the blade face, a brut-de-forge finish like this on a non-stainless steel is supposed to be rustic. Since the edge area already looks reasonably polished, polishing it even smoother should help building a patina instead of developing rust spots. From what I can see in the picture (enlarged) though, you are not dealing with a simple surface rust. The face of the blade, however, appears to be pitted. You are not going to be able to remove these pits without use of machine tools. Don't even try! As anyone familiar with antiques will tell you, the most sure fired way to devalue your antique is to refinish it. The value of your $38 cleaver will be about $0.50 to $1.50 in seconds at a fea market, even before you finish. Not the answer you're looking for? Browse other questions tagged equipment knives kitchen or ask your own question. How do I keep the rice cooker from boiling over? How do you keep ebelskivers from sticking? Can I still cook on my propane grill with rust? How do I keep the paddle of a bread machine from damaging the bread upon removal? How can I keep flies out of my kitchen?